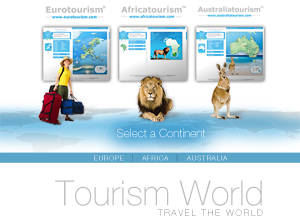 EUROTOURISM is based on a map of Europe where the visitor can quickly and easily link through to the advertiser's website. Accommodation, food, adventure and other activities are represented by easily identifiable symbols on the map. First, the visitor selects a country, then the region they are planning to visit – then they are able to find the business offering the products and/or services they are looking for – and in the right place! We offer very cost-effective and targeted marketing for advertisers because your potential customer is able to find what they are looking for – and in the area they are interested in visiting. Eurotourism is translated to 21 different languages! As an advertiser, you receive the most optimized world wide marketing exposure because your symbol or advert is displayed under all 21 languages - thereby having the potential to reach every corner of the world. Even through our services for distributing printed maps, we have received requests worldwide. Would you like your advert on the front page of a specific country? We can target exactly “where” and to “whom” your advert can be exposed. For example, a banner on the front page of Denmark and under a specific language provides you the ability to attract exactly the new customers you want. So, right from the start you can see a high result in your advertising. Symbols provide a quick interpretation! Different types of symbols are displayed over the map depending upon the business being promoted, i.e., hotel, conference etc. Would you like to have your tourist related business promoted under the symbol relevant to your business - and the symbol linked direct to your website? Of course, you can have more than one symbol to promote all aspects of your business as well, for example; one symbol for hotel, one symbol for conference, and so on. - On a specific country’s start page (i.e., Sweden) plus one language (i.e., Swedish), €990 for 3 months. - On a specific region, under all languages, €990 for 12 months. - On a specific region, under a specific category, all languages, €650 for 12 months. - On a specific Tourist Guides web page (by Municipality), all languages, €650 for 12 months. One symbol linking to your website, €390 for 12 months (shorter periods are available, depending upon availability). If you would like more than one symbol to better describe your business (i.e., Hotel + Conference + Golf), we can offer a 30% discount for each additional symbol, providing the additional symbols have the same link address. To download a price list in PDF format, click on Prislista 2009 (Swedish only). Please contact us for a price list in English. The visitor easily downloads a tourist and travel guide for any municipality in Sweden. The visitor can find everything – and a little more – displayed in a convenient format! Regardless of the municipality, large or small, we have a tourist guide for you. As an advertiser, you have the opportunity to influence a customer even before their trip or vacation. All guides will be available in three different languages; Swedish, English and German. There is also a business register on the page, where your contact information can be seen with the companys name, address, telephone number, etc. To download a Tourist Guide Price list, click on Turistguide 2009 (Swedish only). The above services are provided by Eurotourism Media Group AB.